Hey friend! Are you stuck on what to get your horse-loving friend or family member for Christmas? Well, I have a solution! Today, I am giving you my horse lover gift guide for ideas on what to get your equestrian friend or family member for Christmas. Christmas is just around the corner! Can you believe it? Personally, I like to get a head start on my Christmas shopping so the products I want don’t run out and, so I can beat the Christmas rush 😊 This list may help you get a jump start on your shopping. I don’t know about you, but I LOVE subscription boxes! They are definitely becoming more popular and honestly, they are so easy to purchase and they give you many different products to try out. One subscription box I love is The Saddle Box. The Saddle Box was created to strengthen the special bond between horses and their owners. Each month The Saddle Box includes 6-8 fun surprises such as horse treats, tack, and grooming products. The items in the box are full-size and each month the box is only $34.95! This box makes the perfect Christmas gift for any horse-lover and their horse! I just recently came across HorseGloss and it is amazing! HorseGloss is your front-row pass to all things lovely and chic about horses. It has many different products such as equestrian iPhone cases, saddle pads, jewelry, and more! I especially love their jewelry such as their rose gold bit bracelet and their horse treasure bracelet in rose gold as well. If your equestrian friend loves jewelry, I definitely recommend HorseGloss! Gift idea #3 is clothing from the TKEQ Shop. The TKEQ Shop is an apparel company dedicated to bringing you fun graphic tees for your equestrian lifestyle. Their t-shirts are super cute and affordable! Not only do they have t-shirts, but they also have sweatshirts, saddle pads, and long sleeve shirts. These shirts are super easy to put on to get ready for the barn or for your riding lesson. If you subscribe to TKEQ you automatically receive 15% off from your first order! It is a great deal. The fourth gift idea is to get your friend and her horse a saddle pad from Aztec Diamond Equestrian. 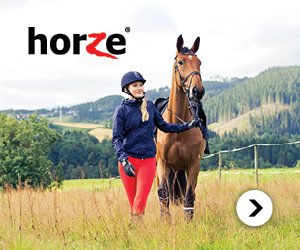 Aztec Diamond Equestrian is an amazing equestrian clothing brand and also has horse wear as well. They have super cute, but simple saddle pads in three different colors: navy blue, black, and white. On the saddle pads is the Aztec Diamond Equestrian logo. Any of the products in this store look incredible and super cute! Each year they also launch a lookbook filled with quality pictures of their upcoming products. I definitely suggest Aztec Diamond Equestrian to any horse lover wanting to amp up their riding wardrobe and their horses as well. EvoEquine Rainbow Gloss Bits… let me just say… WOW!! They are soooo pretty and this bit is definitely on the top of my wishlist. The EvoEquine Rainbow Gloss Collection is a completely extraordinary range of Bits, Stirrups & Spurs designed to look beautiful whilst helping your horse perform. From blues to purples, greens, golds and pinks the Rainbow Gloss coating provides a unique array of colours to otherwise boring stainless steel items. If you are an equestrian, who loves a little pop and color, these are definitely the bits for you! This is another great product for an equestrian friend who loves color and pizazz! Twinkle Glitter is a store that creates glittery and sparkly gels and powders to put on your horse for Horse Shows or just for fun. They even have glittery hoof polish to put on your horse’s hooves. These products will totally make a statement whether you are in the show ring or just riding around at your barn. They are also great for photo shoots! (hint, hint – maybe going to be happening soon). Take your grooming skills to the next level with Twinkle Glitter! Okay… I know… I am really on the bling topic right now, but I can’t help it! Sparkles just look sooo good on horses, am I right? Whatever brand, bling browbands are a great gift for your equestrian friend and her horse. There are so many different styles of browbands including a little bling or even just a pretty stitch. Find the perfect browband for the horse and friend you are gifting this year! They will love it, I promise. Lastly, the perfect gift for your horse-loving friend is the “Love Laugh Ride” or the “I’d Rather Be Grooming a Horse” mugs over at Samberwill Equestrian Blog. Each mug is hand painted and fired and the super sparkly glitter does not shed. These mugs come in two different colors, one is pink and one is blue. I totally suggest these mugs to anyone wanting to add a little bit of sparkle to their life (I mean who doesn’t?). I hope you enjoyed this post and that this gift guide gave you ideas on what to get your friends for Christmas or even for their birthdays! What was your favorite gift idea? What are some of your gift ideas for equestrians? Let me know in the comments below. Have a great day and happy shopping! Until next time… don’t forget to hug your horse! This was such a helpful post, Keeley! I loved all your ideas and I can’t wait to check out the companies you mentioned! Great post as always! Aw, thanks Taiya! You are so sweet 🙂 Thanks for commenting!